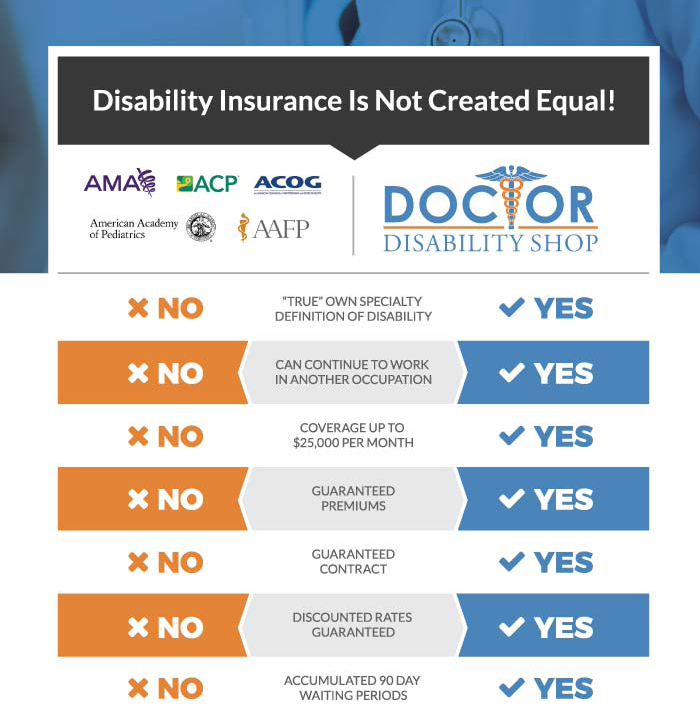 The Doctor Disability Shop is the premier source for the best Own Specialty Disability Insurance. Getting the Best Own Speciality Disability Insurance is an essential element to every physician’s financial well-being. Your ability to earn an income in your specific specialty is your most valuable asset. Unlike most other white collar professionals, disability is most important to those in the medical field. You are highly educated, trained, on your feet, and working with your hands 40+ hours a week. You are not simply working 9-5 behind a desk in a low risk field all day. Because doctors are specialized in their specific field they are susceptible to disability. We don’t have to tell you that it’s not easy to become a cardiologist! With all the hard work, years of education, and training you owe it yourself to protect what you have worked so hard to accomplish. By purchasing the Best Own Specialty Disability Insurance, you will have peace of mind that your investment is covered. We only work with doctors because we understand how valuable your time is and how important it is to use the time you do have productively. We work with every carrier that provides the Best Own Specialty Disability Insurance specifically for Doctors, and when you work with us we will provide you with apples to apples comparisons from every carrier and educate you on any difference between contracts. Because of our many years of experience we have become experts in reviewing our clients existing coverage and comparing it to the best Own Specialty Disability Insurance that is available in today’s market. Since our expertise lie in the area of disability risk management, we can help you determine the risks to your career, your practice and your financial future. When it comes to assessing disability concerns, our skills will be a huge asset to you. Our service extends to doctors nationwide, so no matter where you are you will be able to reap the benefits of working with a professional company like ours. We only work with the insurance carriers that offer doctors “true specialty” products and we are experts in the insurance underwriting process. We will get you through the underwriting process with ease with the least disruption to your schedule by laying out the process up front and offering you white glove service the whole way through. Because we have been at it so long, our doctors will also be able to cash in on discounts of up to 50% that we have established along the way! Begin protecting yourself and your practice today with the best Own Specialty Disability Insurance. Click to calculate your savings and improve your coverage!